Sometimes dogs, cats and other pets give you “presents”. Urine stains on your newly purchased carpet. Both misshappen and with that disgusting smell that every dog owner hates. Sometimes you might even get some brown or yellow stains. Your formerly pristine carpet now looks like a crime scene and smells like a barn. Thankfully, there is an easy solution. A carpet cleaner can quickly and easily manage your pet stain problem. It can also help with any other stains that may have made their way into your house. Choosing the right carpet cleaner takes some time though. Our list will help you narrow down your search for the overall best carpet cleaner. Budget is always an important consideration too. Those of you that want the best cleaner possible might want to place less emphasis on budget. This is especially true for those of you with a large dog or multiple dogs. Budget carpet cleaners simply cannot handle the a high workload. For the most part, you’re going to want to keep the following in mind while making your decision. 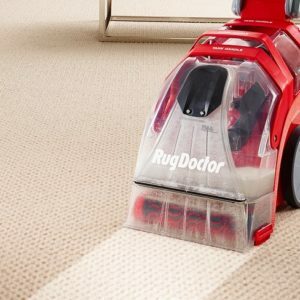 A more high-powered motor means a cleaner carpet. Lower powered motors makes sense if dealing with thing office carpet or the accidental coffee spill. They also work well for the dust that inevitably gets tracked in from outdoors. Light motors don’t work if you’ve got heavy mud getting pulled in by boots or grease coming in from the kitchen on shag carpeting. A high-powered motor is your only option in that case. A good rule of thumb is that the heavier your carpeting and the more exposure; the more powerful of a motor you’re going to need. There are a few different types of carpet cleaning machines that you should know about. Some are easier to use than others. This makes them especially useful if you are less physically capable. Full sized cleaners are particularly difficult to handle. This makes them less ideal for those who aren’t quite as strong. It also makes using them difficult in smaller rooms and tight spaces. A full sized cleaner really only makes sense if you have a house or a large apartment. 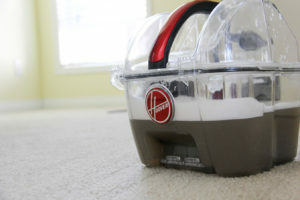 Compact cleaners have lower amount of power as their larger counterparts. They make up for this lack of power with more maneuverability and tend to be much lighter. You can even leave some of the higher end units running while unattended. Belt-less models. A belt-less model means you will not have to repair a broken belt. This can save you from the occasional DIY repair. Tanks. A larger tank will mean less frequent refills. Somewhat convenient, but not too big of a deal. Split tanks result in easier refilling since you can add water separately. Hose Length. Longer hoses are great for full sized cleaners because the cleaners can be quite heavy to move. Moving Brushes. Moving brushes are a bit more aggressive than stationary brushes. This makes them great with an underpowered motor. However, they are not a replacement for a high-powered motor. 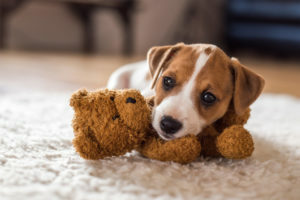 Pets, especially dogs, present unique problems for homeowners. Urine and other waste matter can quickly turn your carpet into a mess. Combine this with the nasty odor and urine seeping into the underflooring and you have a huge problem. Now, a carpet cleaner isn’t the perfect solution to every pet related problem. A carpet cleaner will make your life easier and less smelly. Stain isolators work great for isolating stains. This keeps the urine out of your normal water tank. Using a carpet cleaner without a stain isolator will eventually cause your machine to smell awful. Unless you constantly purify your machine with ammonia and a rag. Something that most people fail to do. Other add-ons can help remove stains and hair. They will trap the pet hair as it builds up instead of letting it clog your machine. If you’re dealing with pet problems on a frequent basis, then you should buy a specialized machine. The alternative is spending an enormous amount of time cleaning clogs and purchasing special add-ons. This of course depends on how much you value you your time. Keep in mind that a few extra dollars might save you a decent amount of time and headache. This upright carpet cleaner is made to handle just about any stain your pet leaves behind. 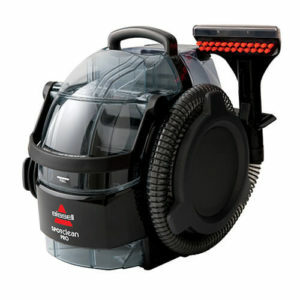 BISSELL has a top notch reputation in the industry, so you know that you’re getting a great product. 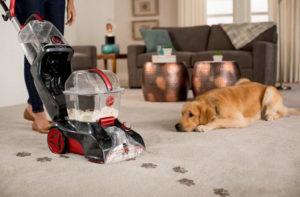 The DeepClean Deluxe is actually designed to clean pet hair and urine stains, which makes it an excellent addition to the home of any pet owner. It also comes with a portable spot cleaner for those areas where the upright cleaner does not fit. 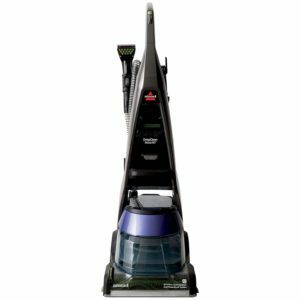 The BISSELL DeepClean Lift-Off is perfect for someone that wants a great carpet cleaner overall and does not want to spend time reviewing different cleaners. This cleaner and the right shampoo is the perfect combination for just about everyone. Here are some other excellent cleaners that you should know about. We’ve also included great shampoos to use with your cleaner. Rug Doctor makes a great cleaner that comes with shampoo to handle pet messes. The main benefit with the Rug Doctor is the largee amount of suction it has. It works well for high traffic areas that are often difficult to keep clean. Have a lot of dogs and carpet? Rug Doctor has you handled. The superior suction and antimicrobial brushes are a huge help. The “Super Boost” spray function does a great job turning messy areas into clean ones. One area that we don’t like is how delicate the machine is. Most people don’t have any issue with it, but it can break if you bump it into the wall a few too many times. Be careful when using this cleaner. 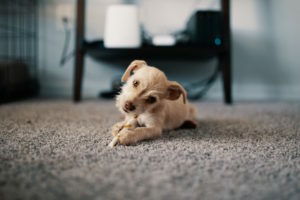 Overall, if you’re not concerned with brand names and want a solid carpet cleaner that makes one of the best ways to get dog hair out of carpet, then the the Rug Doctor may be the solution for you. First things first, this isn’t a great cleaner if you have a large carpeted home. This works best for those that have small spots of carpet that need the occasional cleaning from a non-upright carpet cleaner. This spot cleaning unit fits away quite easily and can be stored just about anywhere. Small cleaning closet? You will have to put in some work since the bristles aren’t great and there are better options for pet hair. Fortunately, cleaning out the interior of the unit is rather simple, which does prevent the machine from smelling and collecting a large amount of pet hair. 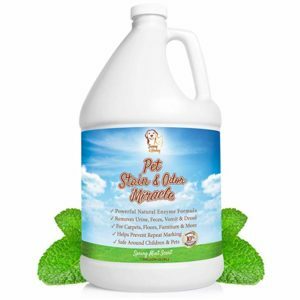 This is the easiest solution for urine and other unsightly pet stains at this low price point. This works great for spot cleaning on small patches of carpet, but this just won’t work for a fully carpeted home. We’re going to come right out and say it: this cleaner is pretty awesome. It works great no matter how much carpet you have to clean or the difficulty of the stain. 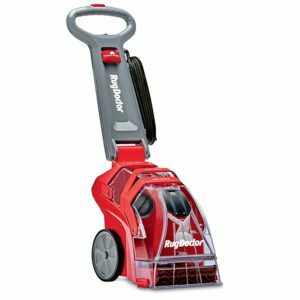 Removing dirt, grime, hair, and stains isn’t an issue since Hoover designed this cleaner for high traffic areas. Even the brushes on this design ensure that smells and stains get gone and stay gone. The biggest drawback is that it’s not a 2-in-1 cleaner, so you can only use it as an upright cleaner. This makes it difficult for those hard to reach spots. small vacuum in those situations. The Hoover still wins out if you’ve got a large carpeted home with a ton of problems with urine and other pet grime. Just as long as those problems aren’t in hard to reach places. We all know that dog urine can be problematic. Even in the best case scenario – when it’s noticed instantly. It still has a tendency to seep into carpeting and sometimes under the flooring. This leads to odors that just won’t go away not matter how deep of a clean you give your carpet. The key here is solving problems in the right order to make sure that you can mitigate or the damage or completely neutralize it. Immediately soak up as much as possible without rubbing it into the carpeting. Then spray it with a urine removal shampoo. Do not rub the shampoo into your carpeting. Next you want to bring out the cleaning machine. Never overload the machine. It will not work better and just wastes shampoo. Always use your manufacturer’s recommended amount of detergent. Following those steps will ensure that the stain is taken care of quickly and efficiently rather than making things worse. It might be tempting to pull out your expensive carpet cleaner, but the above steps will minimize the chance of permanent staining. There’s something out there for everyone, but let’s talk about three of our favorites and why we think they stand head and shoulders above the competition. Bubba’s knows that our pets sometimes get in trouble. They’ve made a cleaner to help you out when that stain and odor hits the floor. It’s even supposed to work with the smell of all – cat urine. It’s a pricey option. However, a first line solution before you run your cleaning machine is one of the best purchases you’ll ever make. 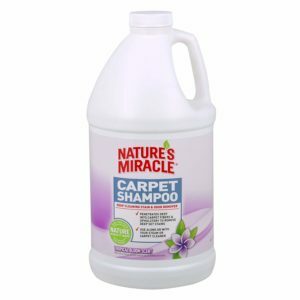 This carpet shampoo can easily lock down most odors. Combine this with your cleaning machine and you’ll be in great paws. There’s not a lot of foaming action in there, so you may have to use a bit more than normal. Another interesting perk with Nature’s Miracle is that they have a subscription service available. This makes staying stocked super simple. One annoying part is that the unscented version is sometimes difficult to find. Fortunately, the lavender smells pleasant. It’s certainly better than cat urine. It’s a slightly more expensive, but this enzymatic cleaner is the best you’ll find. It locks in odors and can handle minor stains. You might never have to worry about smells and (small) stains when combined with a steam carpet cleaner. It also works great for more than just carpet. 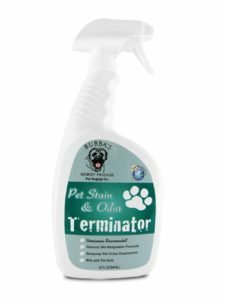 This makes it a perfect all around solution for any pet owner. One important note: Don’t use this product with a normal vacuum cleaner if you let it set. The results aren’t pretty. It still works great with wet/dry steam cleaner though. Just let it sit and swoop it up. You’ll be amazed by the results. You don’t have to accept stains as part of owning a pet. A cleaner combined with the right shampoo can solve one of the biggest problems of pet ownership. All you need is a little research and you’ll be on your way to an odor and stain free home. A somewhat difficult task for the majority of pet owners.